Evacuated (vacuum) Tube solar panels are a popular option in Ireland due to their ability to work better in the colder and duller days we experience during the winter here. Although the flat plate collector solar thermal option may produce more heat on a warm and sunny day, vacuum solar thermal tubes will produce heat over a wider spread of the season giving more heat to your water in the Winter. It is worth noting however that both Flat plate and Evacuated tube solar thermal systems can be designed to give you the same amount of overall energy throughout the year so please don’t be fooled by the “evacuated tube systems are more efficient argument” when deciding on which Solar Thermal system to install. Essentially, the energy yield of the system for the money you pay is the key decider, not the efficiency.With regards evacuated Solar Thermal tubes, there are many different options and many different providers on the market – all telling you that they are the “best” or the “most efficient” etc. The reality is that most solar thermal panels are tested to the same quality levels and all systems can produce roughly the same amount of energy if designed properly. The difference between different solar thermal systems boils down to three things really: Price, Energy Production and Warranty. At Hotfoot, we are committed to making life easier for you so provide quality products of many different manufacturers including Kingspan, Gasokol, Ecologics and Hailin. 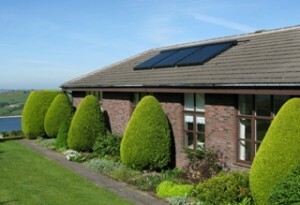 We can also talk you through the advantages of each solar thermal system to see which suits you the best. Over the past few years, Chinese solar products seem to have a gotten a bad reputation in Ireland with a viewpoint that they are of bad quality. To-date one of our best selling solar systems has been a Chinese made solar thermal panel and it is tremendous value for money and comes with the same quality testing certification as any European made solar panel. So again, please don’t be swayed by the argument that Chinese made is sub-standard for energy production and payback these panels are great value. Our aim is always to to be honest with our customers and pass on the savings from the low-cost manufacturing base to provide economical and efficient solutions for solar thermal water heating. A 2m2 panel will provide sufficient hot water for a small family (2-3 users), and is best matched to a small water tank (no more than 175 litre). 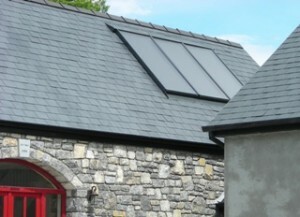 We also offer a 3m2 panel and either of these can be interconnected to make any size of panel providing economical hot water for houses, factories, hotels, swimming pools or any other application that requires hot water.Solar thermal heating is available to every house in Ireland! Every house should have one -really! The table shows recent NASA figures for the average solar heat arriving in Ireland per day per square meter. Surprisingly, this is about 60% of that received at the equator. The total cost saving per year is approximately €151 for a panel which after the grant will cost you just €355. Depending on your installation, there will be other costs, such as a pump, controller and installation costs. Also, we have factored in to these figures efficiency which falls off as the water tank heats up.In a new house installing a solar water heater is a no-brainer. In a retrofit, it really depends on how easy it is to get into the loft space etc., but you will still save money. But no money would pay for the pleasure of knowing that your bath water was heated by sunlight rather than oil, gas or electricity, none of which in the long run are coming down in price! Our Solar Thermal panels are registered with SEAI for the Better Energy Grant Scheme.